Check out this adorable Polkadot Blossom branch wall decal! Our wall decals are ideal for offices, living rooms, entryways, classrooms, even your car or glass shower doors! Branch measures 50 inches wide by 22 inches tall. Large blossoms measure about 5.5 inches wide by 5 inches tall. Small blossoms measure about 3 inches wide by 3 inches tall. 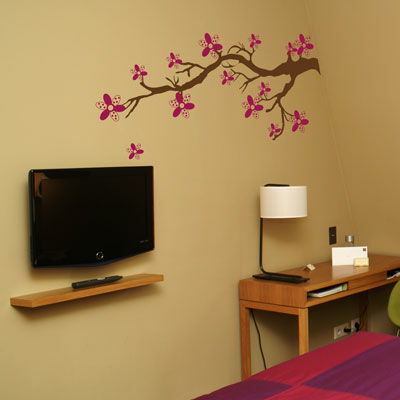 Our Polka dot blossom branch wall decal comes in one piece for easier application! Blossoms come separately so you can place them however you choose! We purchased the dandelion for my daughter's room at college in her new apt. She received LoTs of compliments! She however had to move from there fairly quickly. She was able to remove the decal without damaging the walls. Wasn't able to save the decal but we are excited to order all new ones for her OWN new place with no roommates!!! Thanks so much, the order was quick and the application very easy! These are adorable, you'll want more than one set! I just absolutely LOVE Dali Decals!! I started off with just one funny one for our toilet, then ordered another one for my living room, then another one for my friend's baby room and now yet another for my spare bedroom. They always get so much attention when company comes over. Such a great idea for a wall that just needs "something" extra. And I have to say....Dali Decals customer service is THE BEST (always so nice and they have a way of making you feel as though you are their friend)!!! I will be a loyal customer for quite a long time. Thanks Dali!! I have purchased several of Dali's decals. They're wonderful, go on easy and look fabulous. The personal service was above and beyond. If you need decals, look no further - Dali is your place. I recently purchased 2 decals from here. One for the master bedroom and one for our baby's room. It is amazing how much a decal can transform the room. My baby's room looks ten times better with the decal in the center of his wall. I am writing this after I just purchased another decal for our bedroom. I have already told friends and co-workers how awesome these decals are.